A spiritual place which binds the past with the present on an axe of more than one thousand years, lies today under the sun of Austria, where the European monastic Christianity embodies an earthly kingdom. Melk Abbey, which is a Benedictine abbey, watches over the town of Melk from a rocky outcrop overlooking the Wachau Valley of the Danube river. Dating from 1089, the abbey was at first the residence of Leopold I, until 113 years later, his descendent, Leopold II, also Margrave of Austria, gave the castle to Benedictine monks from Lambach. Ever since, the monks have lived and worked here without interruption, thus Melk Abbey being one of the very few places which has continuously performed its function. A peculiarity that increases the value of this place is the double role it had in time, history registering it as both a secular and a theological site. In the 12th century a theological school was established and connected with the monastery, enriching the place with numerous valuable manuscripts that have been created in the library, fact which lead to the Melk Reform. Besides having been the starting point of one of the most important medieval monastic reforms, and having reached a point when it had strong connections with the Humanists at the University of Vienna, the most visible proof of this monastery’s importance is the very castle that shelters it. Built between 1702 and 1736, this magnificent baroque construction is a symbol of welfare and art, being the result of Jakob Prandtauer’s work combined with the help of some of the most renowned artists of the time. The painter Antonio Maria Nicolao Beduzzi made the interior paintings and frescoes from the main building, while Paul Troger painted the sanctuary, which had been designed by Giuseppe Galli-Bibiena. Furthermore, the church was painted on the inside by the Austrian painter Johann Michael Rottmayar, and in 2007, the central dome of the church of Melk was selected as main motif of a 10 euro collectors’ coin: the Austrian Melk Abbey commemorative coin, minted on April 18, 2007. Due to its academic stature and fame, Melk Abbey managed to survive the dissolution during the rule of Emperor Joseph II, unlike many other abbeys which were seized between 1780 and 1790. However, Melk faced harsh times as well, numerous state regulations having been imposed on the monastic life: the theological school of the monastery was closed; imperial lay administrative abbots were installed etc. The Napoleonic Wars, the end of the feudal period and 1848, and then the period of the two world wars brought great and numerous problems to the monastery, consisting in substantial economic changes, threat of imminent dissolution by the National Socialists after the “Anschluss” in 1938, the seizure of the secondary school, the confiscation of a large part of the abbey for a state secondary school etc. At the end of this period of oppression, after the Second World War, the school was restored to the Benedictines, hosting approximately 900 children of both sexes. Melk Abbey is nowadays member of the Benedictine Confederation, which used to be the Austrian Congregation, and is also part of the UNESCO heritage. As a tribute to the abbey and its famous library, Umberto Eco named “Adso of Melk” one of the protagonists of his novel, “The Name of the Rose”. 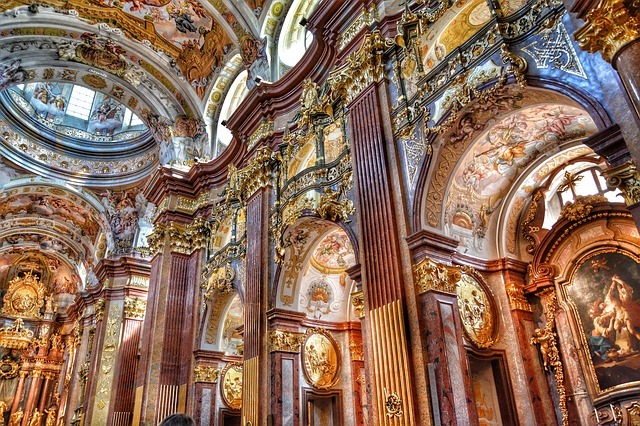 Melk Abbey is until today a stout symbol of spirituality and art, enriching Europe and the world of Christianity with its inestimable value. Neither time, nor oppression managed to cease the existence of this kingdom of divinity on earth, all the difficulties that ever stood in its way strengthening the duty of mankind to preserve at all costs this ancient monument.